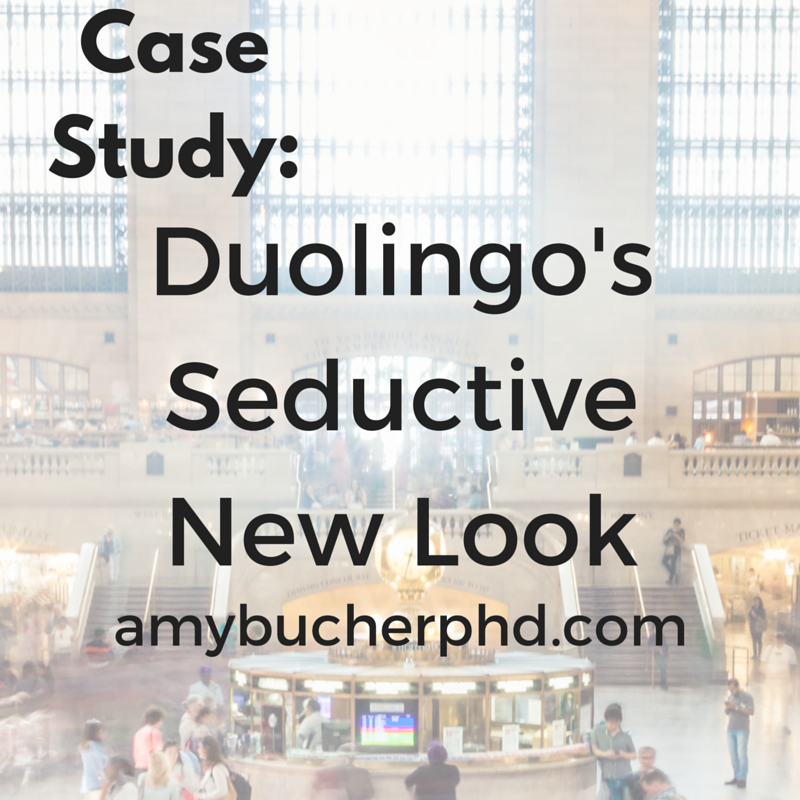 Case Study: Duolingo's Seductive New Look | Amy Bucher, Ph.D.
As far as online experiences that embed motivational design principles, Duolingo is the best I’ve seen. This free gamified language learning tool incorporates all three of the fundamental needs described by self-determination theory in a natural, engaging way. 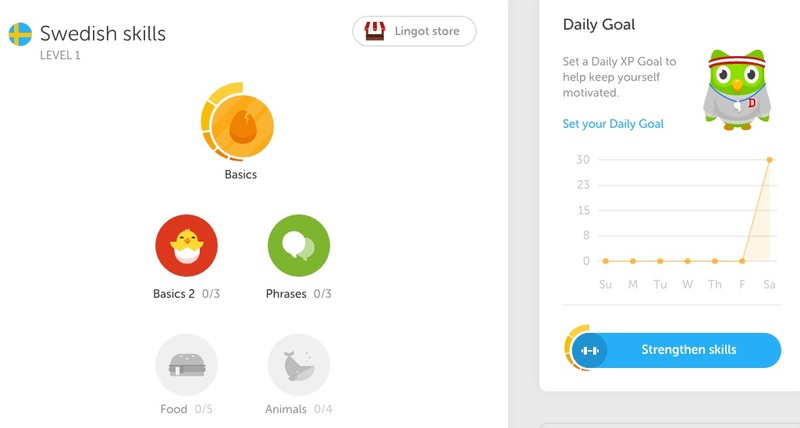 Although someone obviously thought very carefully about how to design the Duolingo program to maximize motivation, the experience feels very organic to the user (unlike some solutions that tack gamified elements on without a logical purpose). 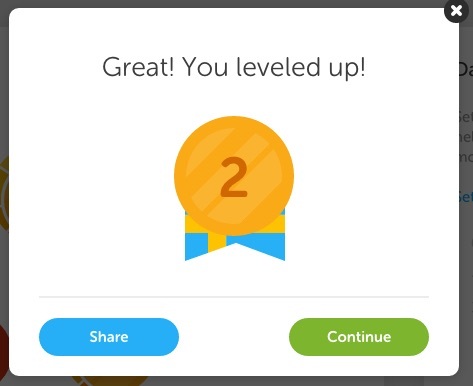 I had used Duolingo near daily for a while about two years ago when I decided I wanted to learn a little German. The program engaged me enough that I stuck with it to “graduation,” and I’ve revisited it a few times since then to polish my skills or just pass some time. 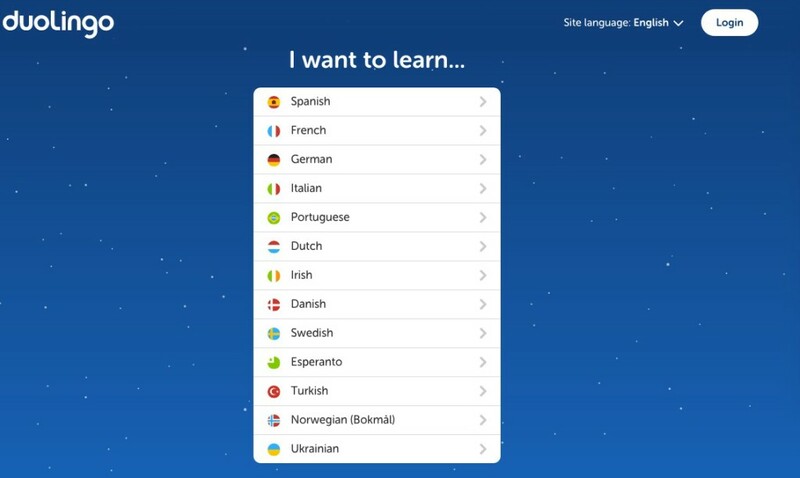 In the last several months, Duolingo went through a redesign. The first time I opened the site to see changes, I felt anxious: Why would they mess with something so perfect? It turns out, because they could make it even better. The sign-up process is clean, clear, and offers the user choices (autonomy support). Here you see the user can select the language he wants to learn during registration, as well as set the source language. Once registered, users can also choose additional languages to explore. The path the user is asked to take through language learning is clearly defined, with choices along the way (autonomy). New users can first indicate whether they’d like to start fresh or take a placement test to begin at a more advanced point. You can see a visual representation of what you’ve completed as well as a daily XP (experience points) goal to work toward (competence support). The cute owl in his coach’s gear doesn’t hurt the experience either. Within each overall lesson, you can see the sub-lessons you will learn and understand how you need to progress through them (autonomy support). 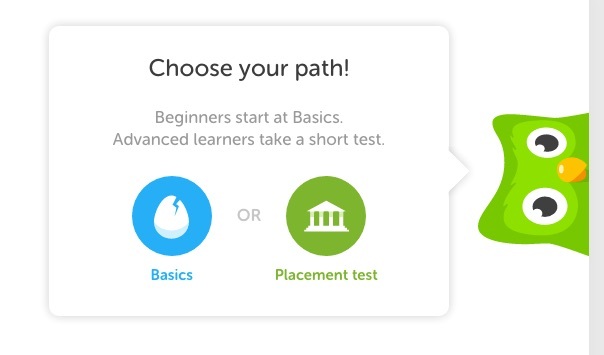 Especially in the first few lessons, Duolingo offers visual and context clues to help you successfully answer each question (competence support). As the lessons get more advanced, clues become less obvious. 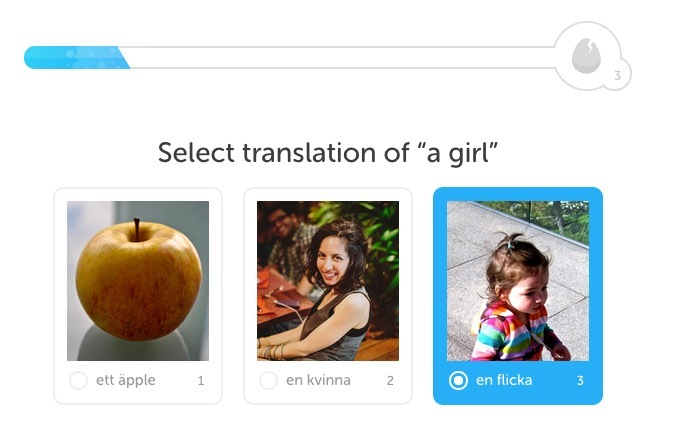 For example, instead of seeing photos of the right answers, you might have to mouse over a word to get a translation. This allows users to challenge themselves if they want. Users are rewarded with positive feedback and XP after every successfully completed lesson (competence support), as well as information on the next “level up” (autonomy and competence support). Providing reinforcement for a job well done helps build self-efficacy and drive users on to the next lesson. Knowing what goals to hit next adds additional fuel. Users who level up not only see their virtual badge, but have an opportunity to share it to Facebook or their other social networks (competence and relatedness support). 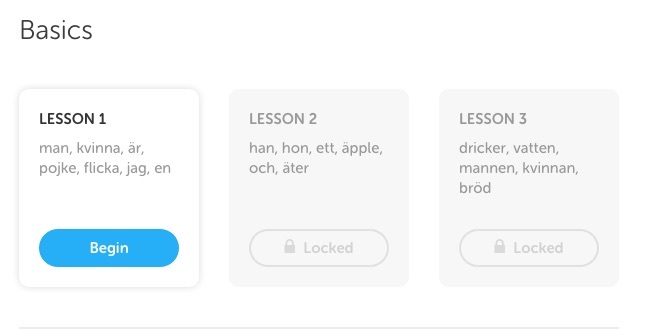 Now we see one of the mechanisms Duolingo uses to connect its users in the language learning process. Users can also see how their progress stacks up against that of their Duolingo-using friends (competence and relatedness support). 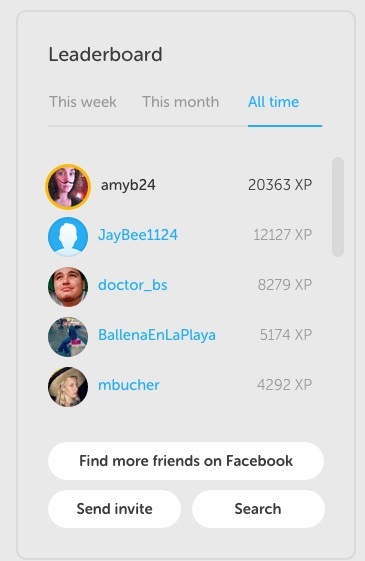 The leaderboard reinforces the social nature of language learning and helps users gauge their progress relative to others. 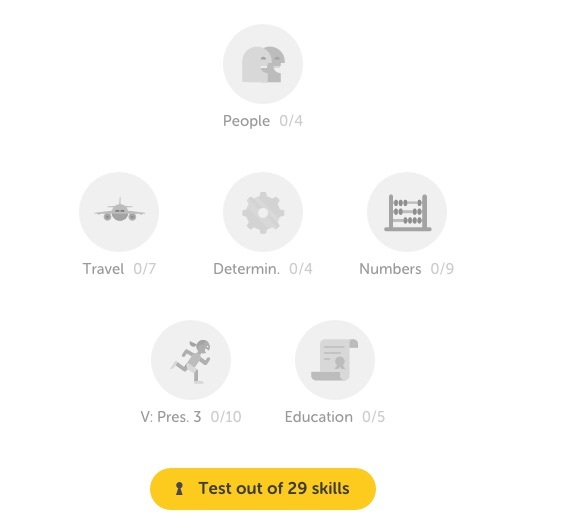 In the case of the screenshot below, my rank is due mostly to obsession with Duolingo rather than any sort of language talent. Users are also given feedback on their overall accomplishment within a language as part of their profile view (competence support). 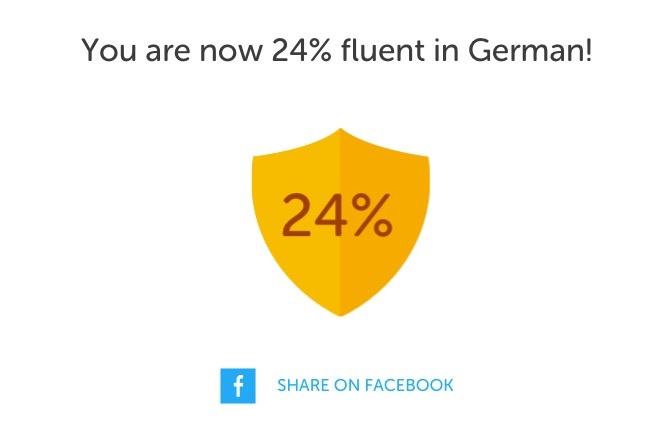 Do I believe that I am really 24% fluent in German, whatever that means? Mein Gott, nein. But it’s still nice to hear and I find myself motivated to amp that number up. 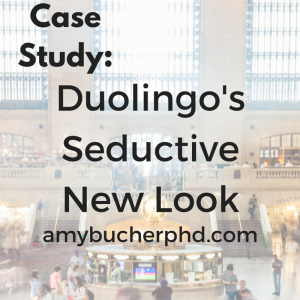 If you ask me, Duolingo is probably the single best example of a technology-driven experience that effectively uses the principles of self-determination theory to engage users. I’m truly blown away by how enjoyable the program is to use, how seamlessly the psychological principles of motivation are woven in to the experience, and how much I have actually learned from using it. Duolingo, you’re amazing. Hey Amy! I just started using Duolingo to brush up on my French and I’m pretty impressed with how fun and easy and addictive the program is! Pretty genius on their part.